Shortlisted for the 2016 Man Booker Prize and chosen by David Sedaris as his recommended book for his Fall 2016 tour. So here we are. My name was Eileen Dunlop. Now you know me. I was twenty-four years old then, and had a job that paid fifty-seven dollars a week as a kind of secretary at a private juvenile correctional facility for teenage boys. I think of it now as what it really was for all intents and purposes—a prison for boys. I will call it Moorehead. Delvin Moorehead was a terrible landlord I had years later, and so to use his name for such a place feels appropriate. In a week, I would run away from home and never go back. This is the story of how I disappeared. The Christmas season offers little cheer for Eileen Dunlop, an unassuming yet disturbed young woman trapped between her role as her alcoholic father’s caretaker in a home whose squalor is the talk of the neighborhood and a day job as a secretary at the boys’ prison, filled with its own quotidian horrors. Consumed by resentment and self-loathing, Eileen tempers her dreary days with perverse fantasies and dreams of escaping to the big city. In the meantime, she fills her nights and weekends with shoplifting, stalking a buff prison guard named Randy, and cleaning up her increasingly deranged father’s messes. When the bright, beautiful, and cheery Rebecca Saint John arrives on the scene as the new counselor at Moorehead, Eileen is enchanted and proves unable to resist what appears at first to be a miraculously budding friendship. In a Hitchcockian twist, her affection for Rebecca ultimately pulls her into complicity in a crime that surpasses her wildest imaginings. Played out against the snowy landscape of coastal New England in the days leading up to Christmas, young Eileen’s story is told from the gimlet-eyed perspective of the now much older narrator. Creepy, mesmerizing, and sublimely funny, in the tradition of Shirley Jackson and early Vladimir Nabokov, this powerful debut novel enthralls and shocks, and introduces one of the most original new voices in contemporary literature. Ottessa Moshfegh is a fiction writer from New England. Her first book, McGlue, a novella, won the Fence Modern Prize in Prose and the Believer Book Award. Her short stories have been published in The Paris Review, The New Yorker, Granta, and have earned her a Pushcart Prize, an O. Henry Award, the Plimpton Discovery Prize, and a grant from the National Endowment for the Arts. Her short story collection, Homesick for Another World, was published in January 2017. 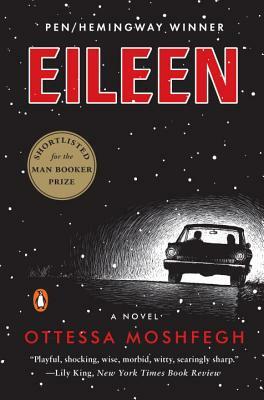 Eileen, her first novel, was shortlisted for the National Book Critics Circle Award, won the PEN/Hemingway Award for debut fiction, and was shortlisted for the Man Booker Prize. "Rife with dark emotions and twisted fantasies, Moshfegh's psychological thriller is the sinister account of the reclusive Eileen, whose prospects for escape from her abysmal life take a turn for the worse when a friendship with a coworker spirals into obsession."